This recipe is gluten free, dairy free and refined sugar free. 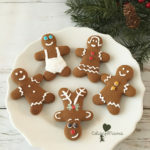 It makes 24 small (3 inch) gingerbread men cookies. Add the coconut oil to your mixing bowl. Turn the mixer on low and add the egg, coconut palm sugar, and molasses and mix until well combined. Slowly pour the dry mixture into the mixing bowl continuing to mix it on low for a minute. Turn it to medium low and slowly dribble the water into the bowl. Remove the dough from the mixing bowl with a spatula - should be smooth but thick - and place it on the plastic wrap. Place the dough in the fridge for a minimum of 3 hours, preferably overnight. Cut a piece of parchment paper the size of your baking sheet and lay it on your counter. Remove the dough from the refrigerator, unwrap it and place it on the parchment paper. Press down with your hands to flatten it a bit. Place a new piece of plastic wrap on top of the dough and then roll to 1/4 thick with a rolling pin. Remove the plastic wrap, and get your cookie cutters ready. Fill a small bowl or plate with 1/8 cup water. Dip your cookie cutter in the water, and then cut out your gingerbread man shape. Peel away the edges with your fingers, or a toothpick for smaller areas. If the dough is not coming up easily, place it back in the freezer for 5 minutes and try again. When finished, slide your baking sheet under the parchment paper and place it in the freezer for 5 minutes. Remove your baking sheet from the freezer. Bake in the oven for 8-10 minutes, until firm but soft. Let cool completely and then decorate with your favorite gluten free icing and sprinkles. Tip: To maximize your cookie cutting on the dough, it's a good idea to cut out the shapes as close together as you can. When you're finished, cut the parchment paper out around each cookie shape and arrange on your baking sheet. This will keep them from growing together while they bake.